These wise words bring a sense of peace to us. They reconfirm what we believe and give us the permission to follow our hearts, and offer children what we really feel they need. Young children need security. They need to trust in their environment. This feeling comes from familiarity and a sense of ‘same old’ so they know what to expect. In this way the daily happenings become the ‘ordinary’, the staples of the programme that the children come to know and anticipate. They feel empowered by knowing, ‘this is what we do here’. Too often adults feel the need to bombard children with ‘new’ all the time in order to stave off the dreaded feelings of boredom. This is well intentioned, but is being interpreted through an adult’s eyes, not from an understanding of what children need and how they actually learn. For children there is comfort in same old. There is also opportunity. They thrive on repetition and also on using familiar materials in new ways. When the new is not being handed to them on a platter, they need to use their own inner resources to discover what else they can do. Creativity can blossom when a child is responsible for their own ‘what’s next’ thinking. Some centres are scared that their environment looks static to the outsider. Adults see an environment set up the same for months and think, how can my child still find things to do? Yet our adult perspective isn’t a child's, and learners themselves are not static. A child in a mixed age group environment experiences it very differently at three, and again at four because they are not the same child. They come with new understandings, learnings, ways of doing things and a new sophistication. They can see and measure their own growth. What we allow children to do when we don’t just offer new, new, new is to go beyond a surface approach and really delve into life and learning. Just dipping toes in before waiting for the next ‘exciting arrival’ creates a sense of restlessness in children. Boredom itself is an interesting concept. It is often feared by adults, and yet it is a wonderfully healthy feeling to have in the short term. We see boredom as an opportunity, rather than a crisis, and children are very able to move on from this if given the chance to solve it. Experiencing ‘I don’t know what to do’ and not having someone instantly fix it for you is a wonderful learning experience for a child. We urge our parents to trust in their child’s abilities here, and to trust in us. We are skilled in knowing if or when we need to step in. We know that children need security above all else. Yes, they need challenge, responsibility and opportunities for action, but children cannot grasp on to any of these things without first feeling emotionally safe. Security needs to be at the very foundation of the environment we offer, and it is through the so called ordinary that this is achieved. Ordinary holds conations of mundane, but we know that the ordinary can be joyous. If we put our hearts behind it and offer nothing without thought, and nothing without joy, then even ordinary moments can be magical. This is especially the case when relationships are so highly valued. Ordinary moments are transformed through the human interactions, and the love and the care put into them. Greetings, nappy and clothing changes and eating together - these are all meaningful moments to engage and connect at the heart level. It is joyous for the child to feel seen and heard and to have time. It is a joy when a child feels safe and a sense of ‘I can do this’. These moments are as exciting to children as any that aim to ‘stimulate’ or entertain. 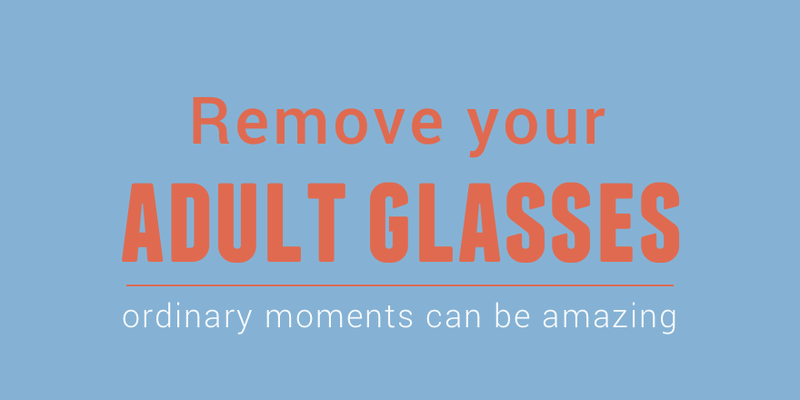 When we remove our ‘adult glasses’ we can see the so called ordinary for what it is for children - it is comfort, it is expected, it is home. Newer PostLet them lead, let us follow - who’s in the driver seat?